David has been a valuable member of our EMS team since 2000, working as an EMT for one year before transitioning to Paramedic. He knew he wanted to serve the community while he was still in high school—he attended EMT school as a senior and worked as a telemetry technician until he was old enough to join our team. David is dedicated to serving patients in Pafford’s Marianna, Arkansas, service area, with its population of 4,115. He often goes the extra mile in his rural community to ensure residents have “over-the-top” care. He and his EMT wife, Lori, have cooked and delivered meals and picked up medications for homebound patients, delivered gifts to children after particularly rough calls, and attended parties as honored guests for patients with whom they have close relationships. Because David has lived in the community his entire life, he knows almost all the people he cares for. Taking care of a patient’s dog while he was hospitalized for three weeks or spending hours on the phone helping patients gain access to needed items such as air-conditioners, fans, ramps, and other resources are routine for him. He also carries blessing bags to deliver to homeless people he comes across while on duty. As a leader, David is passionate about working with his coworkers to ensure everyone is on the same page and able to provide the best care. He even routinely assists EMTs with ambulance maintenance, station upkeep, and protocol review. His efforts have not gone unnoticed—he was honored twice in 2016, receiving the Johnny Gage Award and the Pafford Strong Team Member Award. It’s quite rare to find an EMS team, let alone a married couple, who work together and both show a dedication and commitment to EMS that spills over from the work schedule into their everyday lives. David and Lori Richardson have earned the trust of their whole community because of their sincere care-giving “after the call.” They also enthusiastically advocate for our company and EMS, and that fills the Pafford leadership team with pride. We are very grateful for this wonderful couple, whose knowledge, skill, and dedication mean their friends, neighbors, and our company are so well served. 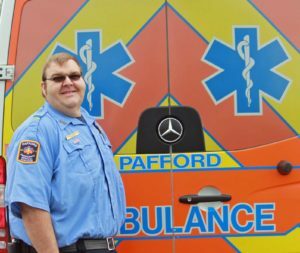 The Star of Life designation is deserved by David and Lori, and it reflects the appreciation everyone at Pafford has for their past, current, and future efforts.